My family loves salmon, and I love making keto meals my entire family will eat. My family has not converted to keto yet, so I am still making two meals a night, anything to make less work for me is a good thing! I usually save meals for this for days when my fat content before dinner has been really low, or when I am planning to have some a keto dessert or fat bombs. The most important part of the keto lifestyle is making sure you meet your daily fat requirements. If you don’t, you will not lose weight. So please make sure you are getting plenty of fat when you plan to have a recipe like this that is relatively low in fat. Another way you can add more fat to dinner with a recipe like this is by frying up some veggies (and as I mentioned earlier adding a dessert or fat bombs to the menu). If you’re looking at this recipe and shaking your head, I can tell you, sometimes it pays to play around with your spices. I wasn’t sure how rosemary garlic and dill sauce would pair, but it was a match made in heaven! My kids complimented the recipe repeatedly and my soon to be teen said it was probably even better because he was dreading it, but it was surprisingly good! Only a pre-teen can both compliment and criticize you in the same sentence. Am I right? But, I will take a compliment anywhere I can get one so pleasing all four kids was enough to make me overlook the other comment. Apparently he’s going through an “I don’t like seafood” phase. Whatcha’ gonna do? Make sure you rub both sides but go easy on the spices on the skin side if you don’t care for rosemary. 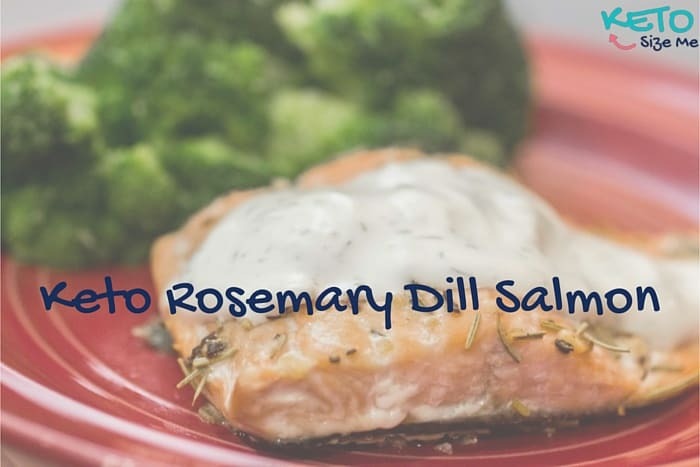 This dill sauce is super easy to make and would probably pair well with other meats so keep this in mind when you grill your pork chops and chicken!